News over the past few weeks has been particularly bleak – death, war, financial collapse. We need to keep in mind that while we listen to CNN, read the paper over breakfast, and listen to reports on the radio and podcasts, our children are exposed to this near unending stream of tragic stories. They hear terrifying words, see horrifying images, and read scary headlines. While these might elicit fear, helplessness, and/or horror (the three prerequisites to traumatic stress), what contributes most to their experience is your reaction. My research and that of others reveal that children (yes, even adolescents) look to their parents as a window on events in their world. How children cope in trying times is largely a reflection of how their parents cope. You need to be strong for your children and maintain open channels of communication with them during this confusing time. In the best possible situation, your careful response to the current crisis could result in “traumatic growth” - intellectual, spiritual or emotional growth in the wake of a trauma. As in the past, I hope that this column gives some insights into how to parent during difficult times. In August 2006, for example, Dr. Baxt and I wrote about parenting during war. At that time, Israel was at war in the North. The principles in that article continue to be relevant today. I strongly encourage families affected by the situation in Israel to review this column for guidance. In this month’s column, I want to turn to another topic: what we tell our children about Bernie Madoff and the effects of his financial dealings had on the Jewish community. I want to start with a disclaimer. 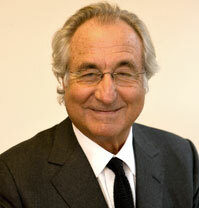 I do not know Bernie Madoff and have no firsthand knowledge of his dealings. Like you, I know the facts from the news: Mr. Madoff, a Jew, allegedly defrauded his investors, many of whom were fellow Jews and Jewish charities. As a result, the vast sums of money lost had the most profound impact on members of the Jewish community, some of whom might be readers of or friends of readers of the Philadelphia Jewish Voice. If you find this article helpful, please feel free to forward it to those who might benefit from it. When addressing any negative world events with your child, tailor the discussion to the maturity level, sophistication and emotional state of your child. Generally, most children will benefit from straight talk, appropriate to their age level, but all children will benefit from plain language. They may need you to explain terms that are unfamiliar to them – mortgage, bankruptcy, foreclosure. Let them know that you will rush the conversation by your body language (sit down) and your actions (give them all of the time that they need). The younger the child, the simpler the message - small bits of concrete facts delivered over time works best. School age children tend to be concrete and moralistic; prepare yourself for harsh comments that they do not mean to be hurtful. Older children may be able to engage in a more nuanced discussion – going beyond the facts to the complexity of causation and implications. Let your child ask questions and respond to the best of your knowledge. As your conversation progresses, let your child ask questions and respond to the best of your knowledge. When you do not know the answer, let your child know this and seek the information. Despite your lack of immediate knowledge, let your child know something much more important - that you are always there for them whenever they are worried, scared, or have questions and that you have their best interest in mind. If your family was affected financially, explain what is happening and why and your financial plan. It is likely that whatever your situation is, your child will imagine something worse than the reality. Young children, in particular, have vivid imaginations. It is always good to start by asking what they know about the situation. From there, let them know what is accurate and what is not. They need to know that they are safe, loved and that their family will get through it. If they hear parents arguing, as will happen during stressful times, it is important to let them know that they are not the cause. It may be hard to see this now, but a family crisis can bring a family closer and can teach children an important lesson about what is truly important and how resilient they are. Children will want to know what they can do to help, so plan for this and have a few ideas ready should they ask. If your family was not affected financially, you should reassure your child that what they hear in the news does not apply directly to them. For your family, this might be a great time to teach generosity and how the Jews come together in times of crisis. Many Jewish causes suffered considerable losses from both the Madoff scandal and the downturn in the financial market. The Jewish Relief Agency , a food distribution service for Jewish families in needs, is at an all-time high demand. Your family can contribute to causes like this through either financial donations or volunteer activities. 2. Anti-Semitism. Anti-Semites tend to relish in stories of unethical, immoral or criminal Jews. The Anti-Defamation League warned that “Jews are always a convenient scapegoat in times of crisis, but the Madoff scandal and the fact that so many of the defrauded investors are Jewish has created aused them to be revived. Not since Julius Rosenberg spied for the Soviet Union has one person so damaged the image and the self-respect of American Jews... [Bernie Madoff] gave credence to the horrid accusations about Jews being untrustworthy and greedy.” Unfortunately, some of these stereotypes are so pervasive on the Web and in movies and media, that many Jews believe them. Work with your child to learn the facts and prepare a response to hatred. One of the most important lessons that Bernie Madoff teaches our children is the importance of values. How sad that a man with such intellect, such potential to do good works took his innate gifts and did so much evil! He lived a lifestyle that many Americans (Jews and non-Jews alike) aspire to – country clubs, fancy vacations and all the associated status symbols. This is a great time to point to Mr. Madoff as a tragic story of values gone bad. Maybe it is time for your family to reflect on the values it holds: what is a real necessity and what is a luxury? What was Mr. Madoff willing to do to acquire more and more things? What are you willing to do? Is it worth it?